Lately I’ve been swimming in light and shadow. It all started about three weeks ago, just as we were approaching the spring equinox, the sun hovering above the equator, day and night equal length. I couldn’t help noticing that the arrival of spring presents us with a gentle invitation to pause and explore the paradox of opposites, when the world is half in light and half in shadow. It’s the perfect time to explore the light and shadow inside of ourselves. 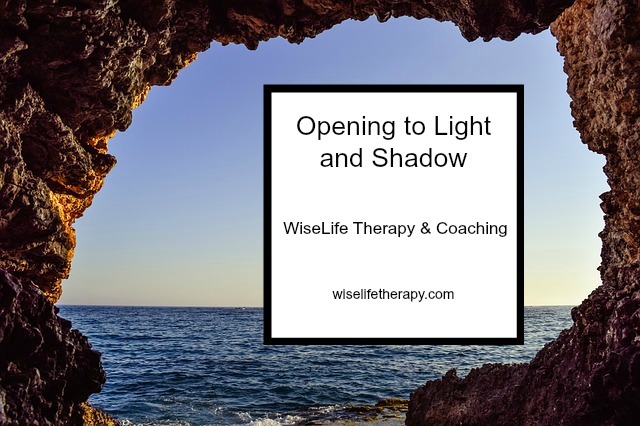 I found myself pondering the psychological nature of light and shadow, particularly in my own journey through life. And while swimming in the midst of many rambling thoughts, a memory came rushing back to me. I recalled an interview I listened to a few years ago with the gifted and rather eccentric German filmmaker Werner Herzog. Among the many things he discussed was his belief that Americans tend to dig too deeply into their psyches, uncovering stuff that is best left in shady darkness. Essentially he was saying you can bring too much light to the shadow within. As strange as it may seem, I kind of understand what he meant. Relentlessly mining the inner darkness for flaws and challenges, in an effort to become your best self (or some other currently popular goal), will likely leave you feeling exhausted and empty. The thing is, this shadow work is not really about uncovering your best self, but rather discovering the mysterious, enigmatic, unknown parts of you, those that are quirky, original, rare and uncommon. And yes, those are often the scary parts too. Still, it can be hard to understand this unconscious realm. It resides in the part of our brains (and bodies) that doesn’t speak the same language we do. Indeed, we can’t always name or quantify what we’re discovering about ourselves when we start to take the inner journey of light and shadow. It may seem somewhat surreal, like being in the space between waking and sleeping, knowing and not knowing. So we must approach the journey very tenderly and creatively, with extreme self-compassion. How, you might wonder, do we do that? First, recognize that you are not simply exploring your inner realms of light and shadow, but you are also lifting the covers to claim the gold in your shadow. And then, think again about Werner Herzog. I suspect that as an artist he holds his shadows close for a reason. I bet he accesses them intuitively through his films and performances. Maybe he even senses that shining the spotlight too brightly would diminish his ability to make use of them in his life and art. For the rest of us, though, who aren’t steeped in a world of creative flow, there are other ways to convene with the shadow. You might start by posing a simple question. Ask: What, inside of me, is ready to burst forth into the light and what still needs the quiet contemplation of the dark? And then give yourself some quiet time to explore this through reflective writing or some other form of process art. Pay particular attention to the metaphors and images that come to you in the process. Let your intuition lead, and don’t try to force the answers. There’s still plenty of time to explore your own light and shadow this season. And you may be surprised by the gold you unearth in doing so. The message is unmistakable; our own healing proceeds from that overlap of what we call good and evil, light and dark. It is not that the light element alone does the healing; the place where light and dark begin to touch is where miracles arise.